Your engineering is already done. We recognized the majority of the soft story building types and have already predetermined the best seismic retrofit system to save time and money. The Dept. of Building and Safety knows us. When we submit your design it resembles previous designs and the engineering has already been approved for other project. Our process has few surprises and we continue to learn and modify to expedite the approval process and provide swift compliance to the intended design. Cookie cutter construction. Our in house staff and management prepares for your onsite seismic work before it begins. The fabrication and materials are ordered and ready for our installers before they arrive. We work fast and clean. We contract with a testing agency to provide fast service and offer the city inspectors a quick review and approval to proceed. In short, we offer a production level solution, a conveyor belt system to minimize the impact for the shortest duration possible, and never more than 30 days. Did you know…? The 30 day trigger is key due to the language holding a landlord responsible to cover relocation costs to tenants beyond this specific window: “If the Primary Renovation Work and any Related Work will impact the habitability of a rental unit for 30 days or more, any tenant affected by the Primary Renovation Work and Related Work shall have the option to voluntarily terminate the tenancy in exchange for permanent relocation assistance pursuant to Section 151.09 G of this Code and the return of any security deposit that cannot be retained by the landlord under applicable law.” (LAMC 152.05A). Therefore, if the work exceeds 30 days or utility services are interrupted beyond the hours of 9am-5pm, the owner becomes responsible to relocate the affected tenants until the work is completed. 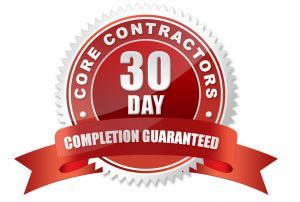 Core Contractors (and no other) understands this potential nightmare and offers to relocate the affected tenants at no cost to the owner if we miss the 30 day trigger. 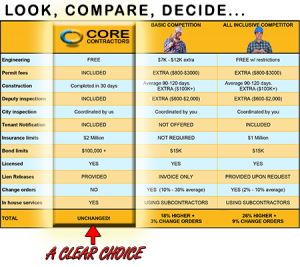 This alone should be sufficient reason to contract your retrofit work to Core Contractors.